Once again the Dance Brigade takes us on an incredible journey presenting a new work, The Great Liberation Upon Hearing, a multi-media dance drama based on the Tibetan Book of the Dead. Working closely with critically acclaimed choreographer Sara Shelton Mann, Artistic Director Krissy Keefer creates a moving and compelling piece of theater engaging the audience emotionally and intellectually capturing the density and profound meaning of the enlightened manuscript. A translucent visual component depicts luminous images transforming the tangible and revealing the intangible. In these dark and trying times the passage to hope is in our rebirth and what better way to convey this than through this amazing multi dimensional work infused with genuine community spirit. A show not to be missed!! I am a big fan of the UC Berkeley J-School photojournalism department. The department organizes excellent and compelling exhibits. 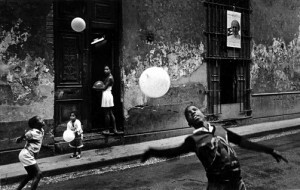 Ernesto Bazan has been photographing the changing lives of Cubans since the collapse of the Soviet Union. He has been awarded many photographic prizes including among others; a grant from the Mother Jones Fund for International Photography(1995);two fellowships, one from the Alicia Patterson Foundation (1997) and the Guggenheim Foundation (2000); the Dorothea Lange-Paul Taylor Prize (1997); the W. Eugene Smith grant (1998); and a grant from the Fund for Investigative Journalism (2000). This will be a very intense workshop where we will explore the many aspects of bringing a group of coherent and consistent photographs together. We will learn more about the photographer’s approach, his or her framing, his or her intentions, his or her ability to discern from the flow of life in the attempt, often vain, to extract its essence. We will critically analyze several important photographic books pointing out what makes them special and also underscoring the causes of the lowering of tension within the book created by many factors among which the inclusion of less powerful images, the wrong pairing of images and bad graphic choices. You are currently browsing the Skyeview blog archives for February, 2009.